Sardines, also known as "pilchards" are oily fish related to herring. They are rich in omega-3 fatty acids, protein, calcium, and are also a source of vitamins B12 and D.
Sardines are often sold in supermarkets in cans, often in oil or a sauce, however can varieties of "sardines" may in some cases contain other types of fish. Sardines are food in many countries cuisines, including Croatian cuisine, Indian cuisine (in Kerala), Portuguese cuisine, and Spanish cuisine. 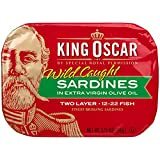 Delicious Wild Planet Sardines in Extra Virgin Olive Oil are a healthy and sustainable addition to your regular diet that you can feel good about. Meaty and flavorful, Wild Planet sardines are a nutritional powerhouse that are rich in omega 3, protein, calcium, and iron. They are also gluten-free, non-GMO and OU Kosher Pareve, so you can snack with confidence. Try them on a sandwich, salad or in your favorite recipe. Ocean Prince Sardines are packed using only the highest quality Pilchard sardines. These sardines have a slightly firm texture and a pleasing mild flavor. Wild-caught and kosher, these sardines provide an excellent source of calcium and protein. Visit the Crown Prince website for recipes. Among the smallest fish used for sardines, our brisling are world-famous for their dainty size, delicate texture, light flavor, and consistent quality. 100% wild-caught when fully mature at just 9.0cm to 13.5cm long, fished in the pristine, icy Norwegian fjords and coastal waters of Norway. Packed in BPA-free, recyclable aluminum cans. Finest quality, tiny brisling sardines in top-grade extra virgin olive oil. Wood-smoked for light flavor. Hand-packed as always. No preservatives. Kosher-certified (OU), and available kosher-certified for Passover (OUP). Try on a sandwich, in a salad, or with fresh pasta. The superfood from the sea. Crown Prince Brisling Sardines are one of nature's most perfect foods. Naturally nutritious, these sardines boast delicate flavor and firm texture. All varieties are lightly smoked and hand packed. We only source the highest quality Brisling Sardines, which are available in a variety of sauces and oils. Just one can provides one-third of the protein needed every day. Brisling Sardines are an excellent source of calcium, and contain 2 grams of omega-3 per serving. Try them in salads, casseroles, sandwiches or chowders. Over 90 years ago, the Season Brand® was the inspiration of a Polish immigrant who started as a food merchant selling specialty products to grocery stores in the Northeast Region. By sourcing the highest quality ingredients Season grew as a trusted brand for specialty fish. In the 1950's, as Season’s reputation as a diversified line of high quality, canned seafood, specialty vegetables grew, Season became a household staple in cities throughout the United States. Today, the Season Brand® continues to source only the highest quality ingredients bringing consumers the superior taste they have known to love. BUMBLE BEE Sardines In Mustard are tasty sardines packed in a delicious mustard sauce. At BUMBLE BEE Seafoods, practicing sustainability is an organizational imperative. As a seafood company, no single aspect is more important, or more central to, BUMBLE BEE Foods’ sustainability program than ensuring the responsible harvesting and management of seafood we provide to our consumers. BUMBLE BEE Seafoods was founded in 1899 by a handful of dedicated fishermen. Today, privately held and headquartered in the United States, BUMBLE BEE Seafoods is North America’s largest branded shelf-stable seafood company, offering a full line of canned and pouched tuna, salmon, sardines, and specialty seafood products marketed in the U.S. under leading brands including BUMBLE BEE, BRUNSWICK, SWEET SUE, SNOW'S, BEACH CLIFF, WILD SELECTIONS, BUMBLE BEE SUPERFRESH, and in Canada under the CLOVER LEAF brand. The BUMBLE BEE brand has established significant consumer awareness and loyalty based on the quality, nutritional value, and affordability of its products.